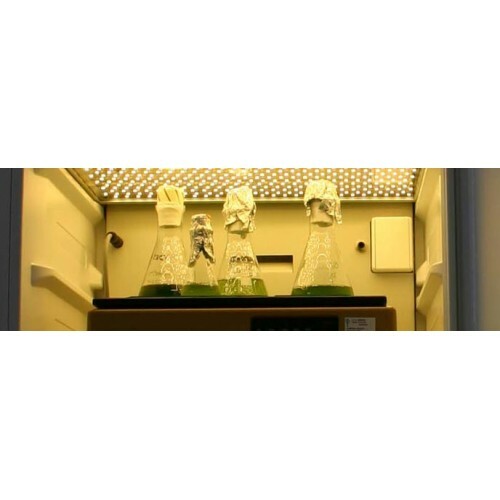 AlgaeTron AG 230 is a floor standing incubated shaker that provides well-defined uniform environment for controlled growing of algae, cyanobacteria and plant tissue cultures in Petri dishes or Erlenmeyer flasks. 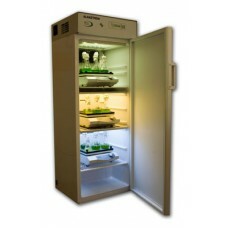 AlgaeTron AG 230 is designed with three independently illuminated tiers of shelving maximizing tissue culture area. Illumination of each shelf is separately controllable in intensity, mode and timing according to user’s defined protocol. AG 230 is designed with minimal footprint size that makes it ideal for laboratories with limited space. AlgaeTron AG 230 is always equipped with a gas port for delivery of external gas. AlgaeTron AG 230 features three electrical outlets (EU type) for attachment of up to three dedicated orbital shakers SHK-2013. Use of different types of shakers is not recommended! Easy-to-read display screen located on the AlgaeTron front side clearly shows operating parameters and actual values. Intuitive programming allows multiple parameter changes to timing, light intensity, light characteristics, temperature, and shaking power. Optionally, the AlgaeTron may be supplemented with a Gas Mixing System GMS 150 that can bring pure or mixed gases into the incubator. Bench-scale orbital shaker with loading capacity of 5 kg. Rotation speed: 30-500 RPM. Dimension (D x W x H): 375 x 320 x 125 mm; weight: 8 kg. Non-skid rubber mat included - suitable for small lightweight containers or Petri dishes and low speed rotation. Tray with sticky matting or Erlenmeyer attachments are recommended for Erlenmeyer flasks shaking with high speed rotation. Stainless tray with sticky matting for safe fastening of various types and sizes of culture vessels. The tray is easily installed onto the shaker SHK-2013 top part. Accessory to Shaker SHK-2013: attachment for up to 14 Erlenmeyer flasks with a size of 50 ml. Accessory to Shaker SHK-2013: attachment for up to 9 Erlenmeyer flasks with a size of 100 ml. Accessory to Shaker SHK-2013: attachment for up to 5 Erlenmeyer flasks with a size of 250 ml. Accessory to Shaker SHK-2013: attachment for up to 4 Erlenmeyer flasks with a size of 500 ml. Accessory to Shaker SHK-2013: attachment for up to 2 Erlenmeyer flasks with a size of 1000 ml. Extends the scope of reachable cultivation temperatures in the AlgaeTron: from +10 ºC to +55 ºC (shaking ON, maximum illumination ON). IMPORTANT NOTICE: Temperature Upgrade CANNOT be used together with Light Upgrades A or B. Enables reaching light intensity in the upper panel up to 1,000 µmol(photons)/m².s and up to 150 µmol(photons)/m².s in the two lower panels. Available just for cool white. IMPORTANT NOTICE: Light Upgrade CANNOT be used together with Temperature Upgrade. Enables reaching light intensity in the upper panel up to 1,500 µmol(photons)/m².s and up to 150 µmol(photons)/m².s in the two lower panels. Available just for cool white. IMPORTANT NOTICE: Light Upgrade CANNOT be used together with Temperature Upgrade. 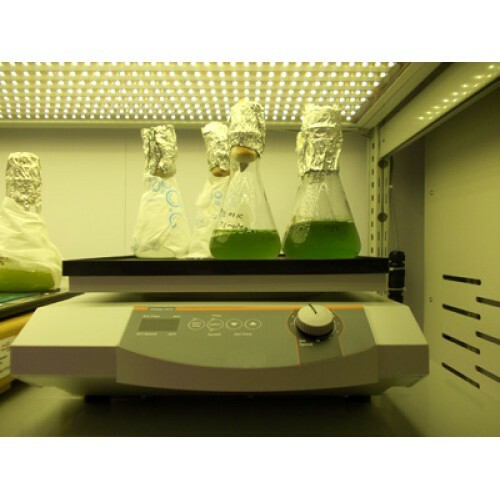 Optional feature to programming AlgaeTron illumination: when uploaded to the device, this Protocol can support up to 224 light phase intervals, each defined by light intensity and duration. The Daylight Protocol serves for cloudy skies simulations - several adjustable parameters. Includes also additional program for "cloud visualization" on a PC. The standard version GMS 150 includes two channels (channel 1 for Air-N2; channel 2 for CO2). Preferably it is intended for use with PSI Multi-Cultivators, small-volume Photobioreactors, large-volume Photobioreactors and Growth Chambers. High-precision GMS 150 can optionally hold up to four channels. Important note: use of a different shaker than SHK-2013 is not recommended! It may cause unpredictable problems and could result in AlgaeTron damage and loss of warranty. 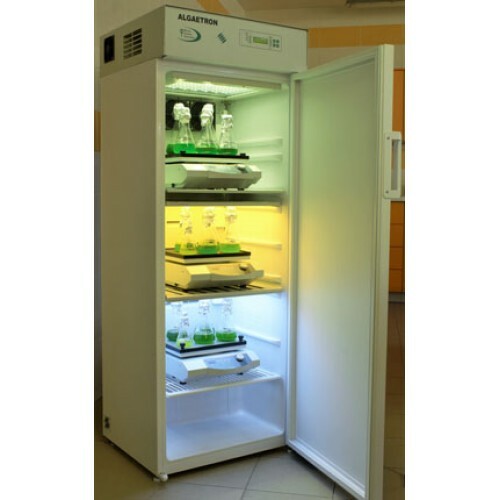 AlgaeTron AG 130-ECO is a floor standing incubated shaker that provides well-defined culture co..